2. 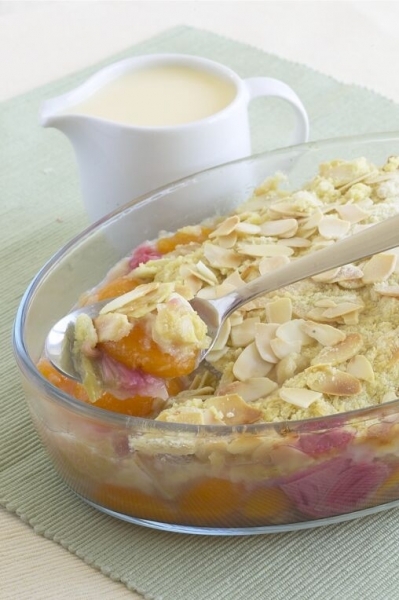 Spoon the rhubarb and apricots into the bottom of an ovenproof dish. Add the ginger preserve and stir in gently. 3. Rub the butter into the flour until it resembles breadcrumbs. Stir in two thirds of the almonds and the sugar. 4. Sprinkle evenly over the rhubarb and apricots and cook, uncovered, in the oven for about 15 minutes. Sprinkle the rest of the almonds on top and cook for another 10 minutes. 5. Pour the custard into a small pan and heat gently for 2-3 minutes until just simmering. 6. Serve the crumble with the heated custard.